15 Days Safari the best of Uganda National Game Parks. You will be picked from the Airport and be transferred to your respective Hotel to relax, have dinner and get ready for the following day trip to Murchison fall national park dinner and Overnight at Forest Cottages. From Kampala after breakfast, Depart at 7 am heading North through the districts of Luweero and Masindi, watching their traditional farms and villages stopping at Ziwa Ranch Rhino Sanctuary for rhino tracking. After re-fueling stop in Masindi town for lunch en-routes, proceed to Murchison Falls National Park. After lunch tour the Top and bottom of the falls, where the Nile crashes through a 7 metres gorge to fall 45 metres. with numerous scenic viewpoints which are a photographers delight! You return for your dinner and overnight at Redchilli Rest Camp/Parkside Safari Lodge. After breakfast cross to the Northern bank you cross with a Ferry and set up for an early morning game drive. Your guide will help you spot Elephants, Lions, Giraffes, Buffalos and rare Hyena they hide and butterflies are abundant. After your lunch you take a boat cruise to the base of majestic Murchison falls, Crocodiles bask in the sun and hippos yawn on the way, Spectacular bird life is found here including the rare shoebill stork and you’re likely to see numerous species’ of animals. Return for your dinner and overnight. At Redchilli Rest Camp/Parkside Safari Lodge. Early morning after your breakfast, head to the forest for the general walks and chimpanzee trekking, you will have a chance of spotting other primates like the red tail monkey, blue and so many more as well, after proceed to Fort Portal pass Rwenzori as the seat of Toro Kingdom go to Queen Elizabeth National Park. Its a volcanic formation of the western Rift Valley towards Queen Elizabeth National Park. The descent reveals a stunning panorama of Lakes George an Edward amid-st game-filled plains. By 2/4 PM go for the unique boat cruise that takes 2hrs on the Kazinga Channel and onto Lake Edward.The trip passes through possibly the highest hippo concentration in Africa and many mammals may be seen drinking water. The cruise offers the excellent platform for photography and game viewing. The birdlife is colorful and abundant. Later your dinner and overnight return to Kazinga Channel View Resort/ Bush Lodge. Wake-up early morning have breakfast go for the game drives of which you will see so many animals like lions, leopards, giant forest hog, buffalo, elephants, difasa, water buck, topi, Uganda kobs are so many and bush buck it takes 3hrs. Return to lunch relax for some few hours and then In the evening take a nature walks, bat caves, and Kyambura escapements where you will have a cross glance of so many species both flora and fauna like butterflies are abundant and different primates with tree species inclusive. Then return at your respective accommodation Kazinga Channel View Resort/Bush Lodge. 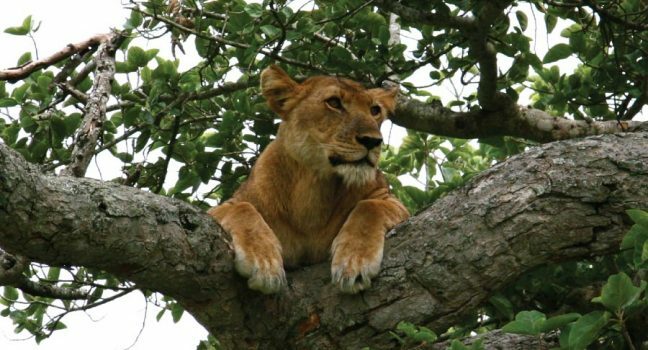 After your breakfast early morning visit Ishasha sector where we find Tree-climbing lions as the only sector for climbing lions QENP diverse eco-system of grassy plains, tropical forests, rivers, swamps, lakes and volcanic craters is a home to an incredible abundant wildlife. Then after Proceed to Imaramagambo or Bwindi impenetrable Forest you will reach late evening have a nature walks 15USD and then go back for dinner and overnight at Broadbill Forest Camp. Wake up early in the morning have your breakfast prepare properly your parked lunch then enter in the jango to trek the fascinating endangered gorillas the rare animals and you will have a chance to sight other primates like the blue, red tailed monkey and other species of animals, your guides will help you so much to catch and have a lot of information and you will come back with memorable moments. Gorilla Trekking takes 6/7hrs almost the whole day. Then later come back drive to Kibale national park you will reach late evening you will have dinner and overnight at Rweteera Safari Park/Kibale Forest Camp. After your breakfast early morning you will have a small briefing with you guides for chimpanzee trekking after get your packed lunch and enter into Kibale Gorge for chimp’s visitors can climb through tropical forest and catch a glimpse of a variety of primates, including chimpanzees and monkeys with other species like butterflies are abundant It can take you 6/7 hours trekking later return and go for Bigodi swampy are for the nature walks their you will have a chance to see so many species of birds and butterflies are abundant After come back dinner and overnight at Rweteera Safari Park/Kibale Forest Camp. Early morning after breakfast drive to Mgahinga national park for gorilla trekking it is found between Uganda, Rwanda and Democratic republic of Congo you will reach a bit earlier but late for trekking you will have your lunch immediately go for forest walks and volcanic climbing where you would have a chance to see the three countries at once it’s kind of tiresome it needs strong people to reach on top it can take you the whole day. Later go back for the dinner and overnight at Mgahinga community campground/Mgahinga lodge. Wake –up early in the morning head to Mgahinga forest for the gorilla trekking fascinating endangered gorillas the rare animals and you will have a chance to sight other primates like the blue, red tailed monkey and other species of animals, your guides will help you so much to catch and have a lot of information and you will come back with memorable moments. Trekking gorillas takes 6/7hrs almost the whole day of course you will park your lunch and go with it in the jungle and later come back for your dinner and overnight at Mgahinga camping ground/lodge. Wake up early in the morning have your breakfast head to Rwanda’s Volcano national park for golden monkeys you will reach late noon time and go for Diana memorial and nature walks later return back to your respective accommodation at Virunga Hotel/Muhabura Hotel. Wake-up early in the morning have an early breakfast get ready with your packed lunch with a small briefing from your guides and head to the jungle for the golden monkeys trekking it will take you 5/6hours and you will have a chance to see other primates after proceed to Bunyonyi dinner and overnight at Bunyonyi overland/ Bunyonyi Birdnest. Wake up early in the morning have your breakfast, proceed to Lake Bunyonyi which is known as the deepest lake in East Africa where you will see the pygmies experience around those small islands with their amazing culture you will have a chance to do both pygmies experience and a boat/canoeing and it’s known as a lake for small birds after relax and have your diner an overnight at Bunyonyi overland/Bunyonyi Birdsnest. After your breakfast you will depart at leisure to Lake mburo National Park have lunch enroutes in Mbarara later proceed for the boat cruises in Mburo, If time permits, you will relax later in the evening go for nature walks where you will have a chance to glance so many species of animal species you finally retire for your dinner and overnight at Rwonyo camp/East’s Nest. Early in the morning have breakfast set off for a game drives which will allow you to spot so many species of animals like zebras, Elande, Uganda Kobs, impala and butterflies are abundant pelicans birds, crested cranes and so many more set-off drive back to Kampala on your way you will see numerous species of birds you will reach at the equator where the sun crosses, it’s a photography delight proceed to Kampala have lunch en-routes take a small shopping if you wish get ready to fly back home with great memories.